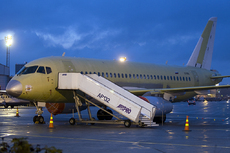 A Sukhoi Superjet 100-95LR flight test aircraft sustained minor damage in a partial gear-up landing at the Gromov Flight Research Institute at Moscow's Zhukovsky Airport. The aircraft was being flown to test the aerodynamic characteristics of new winglets (also called 'sabrelets'). It appeared that the right-hand landing gear could not be fully deployed after the planned flight program was completed. Subsequently, a forced landing was carried out on a foamed runway. On board were three people: a test pilot, an engineer for flight testing and a representative of the certification center; no one was hurt. Sukhoi reported that the damage to the aircraft was "insignificant" and that the aircraft will be restored to continue testing. The aircraft involved in the incident was produced in February 2013 and first flew with new winglets on December 21, 2017. From the time of commissioning, it had performed 535 flying hours for 294 test flights.